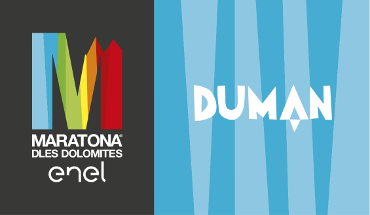 The theme chosen for the 32nd Maratona dles Dolomites – Enel was EQUILIBRIUM. "There is more than one version of truth, it’s nor mine nor yours; truth is a dialogue, a balance between you and me, between who I am and who you are. Truth made of exchange. Self-confidence implies respect. Mutual respect. To have respect, we must be aware and conscious of our actions and thoughts. We must take responsibility, without hiding behind pitiful scapegoats. It’s not always somebody else’s fault. It’s difficult for an unhappy man not to blame someone else, a simple truth written by Leo Tolstoy. It’s only by being aware of our actions that we are able to escape this dead end: an awareness that goes beyond ourselves, allowing us to embrace others; a group of atoms revolving around each other, without ever invading the personal space of others. Keeping the right distance, maintaining a perfect balance. A perfect start with mild temperatures and under a blue sky. These were the conditions at 6.30 am when 9239 cyclists (including 978 women) started the 32nd edition of the Maratona dles Dolomites – Enel 2018. A challenge within another challenge, a passion shared by more than 32.400 applicants who sent their request to participate in the race, which you can actually participate in only if your name is drawn or thanks to the repechage. Seeing the long procession of racers that fill the road from La Villa to Campolongo with their colours for 30 minutes is, as always, pure emotion both for those who watched it live on TV on the Italian raitre channel from 6.15 to 12.00 and for those who supported participants at the start. The finish line was, as always, in Corvara. This year the traditional starting pistol was fired by Eddy Merckx, a world cycling legend. There are always many flags flying at the queen of the international granfondo sportives: 68 different countries (from the five continents) were represented. This year 4,900 cyclists participated for the first time. And their total number was equally subdivided between Italians (50%) and foreigners (50%). There are three courses over the passes, closed to traffic, that made history in cycling: Pordoi, Sella, Campolongo, Falzarego, Gardena, Valparola, Giau, all of them strictly closed to traffic. Distances: Maratona / long course 138 km and 4230 m. altitude gain, Middle course 106 km and 3130 m. altitude gain and Sella Ronda course 55 km and 1780 m. altitude gain. For the second year in a row, the winner of the Maratona dles Dolomites was Tommaso Elettrico from Matera in 4h38’13” followed by Igor Zanetti and Paolo Castelnovo, both after 50”. The women edition was won by the German Christina Rausch.